While we’ve been succeeding in maintaining our healthy lifestyles at The Amazing Blog, some of us felt that there was still something missing from our diet. Eating the recommended amounts of fruit and vegetables can only do so much for your body so that’s where incorporating food supplements like The Beauty Formula from Potion London into your diet can make a difference. Health and wellness brand Potion London have sought out to make a “healthy lifestyle that little bit easier” with their range of health and beauty supplements that targets your specific health goals from within. We‘re already fan of this brand and have written about their Hyaluronic Complex here Their supplement lines address anything from gut and immune system health. After trying two Potion London products (the aforementioned Hyaluronic Complex) we conclude that Potion London has made it very easy to choose which supplements to complement any diet and lifestyle. This we think is perfect for anyone with weak or brittle nails and with it’s combination of 19 different vitamins and minerals. The Beauty Formula is specifically aimed to support strong and healthy hair, skin and nails with the Zinc, Biotin, Vitamin C and Vitamin E enriched in the formula. All of which contributes, supports and maintains your cells’ optimal maintenance and formation. These along with the other vital ingredients in this supplement will help to leave your nails healthy, complexion radiant and hair luscious. If you want a supplement that targets all three of these areas, then one capsule of The Beauty Formula taken daily with food will be the one for you. To purchase 60 capsules or a two month’s supply of The Beauty Formula for £25 click here. Also available is a subscription service to get the supplement delivered every one or two months for an added 20% discount. I’m a particular fan of addressing any hair, nail and skin issues by starting from within and Potion London nail it! We love to make new discoveries here at TheAmazingBlog particularly when they offer us an affordable price-point and great value for money. The British beauty brand Acti-Labs pride themselves in doing just this. They carefully select their high concentrate of botanical ingredients from the south of France, where they create their state of the art and performance-led products. None of their products are tested on animals and their factory in France has even received a Government Environment Award for low carbon footprint. In having their own laboratory, it means that they can offer exceptional value products at laboratory direct prices. We particularly like the Acti-Lab’s core philosophy of ‘using science to get the best out of nature’ and ‘medically inspired products for home use’. Although this brand is probably best known for their skincare, we decided to venture into exploring some of their makeup. They very kindly sent us their Vendome Shimmer Palette that comprises of twelve shimmering and neutral shades of eye shadow. 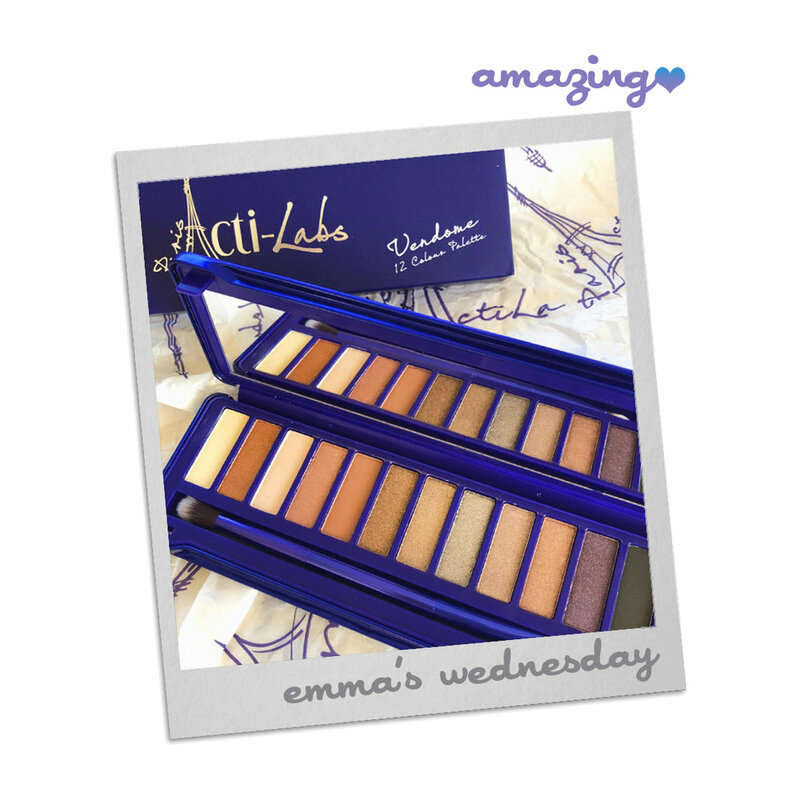 This glamorous Vendome Shimmer Palette is very easy to use to mix and match. What we liked best, is that like other Acti-Labs’ products, this palette is infused with completely natural ingredients like vitamin E, kaolin and jojoba. Not only do the shades apply smoothly, the added vitamin E helps to protect and nourishes the skin. Also included in the palette are a mirror and a two-sided brush, which is perfect for application and blending. With the weather getting warmer, taking baths shouldn’t just be reserved for the colder months. Certainly a more cooling soak in the summer months never hurt. There is nothing more we like at The Amazing Blog than to have a relaxing soak after a session in the gym or an evening run. While we all love a good bath bomb or a therapeutic essential oil, some of us with more sensitive skin prefer something a little less harsh for our skin to completely relax. UK based skincare brand BY SARAH LONDON has developed their Bath Salts with completely natural and hypoallergenic ingredients, which is a winner for us! We recently reviewed their Organic Hair Oil here which we loved. The multi-award winning BY SARAH LONDON was launched in 2017 by two sisters Sarah and Lauren after the latter was suffering from dry, sensitive skin during her recovery from leukaemia. After searching for skincare that was both effective yet non-irritating, Sarah then sought out to start her brand that was transparent, authentic and empowering. The sisters wanted to push this transparency and authenticity by pushing for the use of ethically-sourced, plant-based ingredients in their products. To take this one step beyond, BY SARAH LONDON is the only UK skincare brand that lists all ingredients on the front label of all their products including their Bath Salts. While BY SARAH London products are great for people with sensitive skin and eczema, they also recommend their products to people with all skin types especially those who are conscious about what they put on their skin. Besides having no essential oils or fragrances, BY SARAH LONDON’s Bath Salts contains only three ingredients, making sure that sensitive skin is not irritated. The hand-blended Himalayan Pink Salts, Dead Sea Salts and French Pink Clay all combine in an eco-friendly glass jar to calm and cleanse the body. To start soaking in the minerals, add a handful of the bath salt to your warm bath and enjoy for a minimum of 15 minutes. A 280-gram jar (£20) of the Bath Salts or a 50-gram pouch (£5) of the Bath Salts are currently available to purchase on the BY SARAH LONDON website here. The brand that gives back is back on The Amazing Blog! Regular readers will know that we’re fans of PHB Ethical Beauty, an award-winning, family-run company that gives 20 per cent of its net profits to charity. Check out our brand directory here to see all of their products we have reviewed. The next product to add to that list is the Pressed Minerals 6 Piece Palette in Night. Keeping with the brand’s all-natural, cruelty-free, and handmade products, this pallet’s formula is made of pressed minerals including mica, titanium dioxide, and zinc oxide. Mica naturally reflects light, perfect for enhancing your eyes, while minimising the appearance of pores. Titanium dioxide and zinc oxide create natural SPF30 protection, especially crucial when using the blushers during the daytime. The formula is gentle for use on all skin types (even sensitive and acne-prone skin) as it is 100 per cent natural, vegan, halal certified, gluten-free and paraben free. This pallet has four highly pigmented colours: Almond (a light cream), Onyx (a black with light flecks), Celestite (a periwinkle blue), and Grape (a purple with bronze undertones). Each colour offers a satin-like finish that looks gorgeous on any skin tone and will last all day or night. The pallet includes two blushers to finish your look: Camellia (a bright pink that matches the blooming flowers outside) and Peony (a subdued dark rosy colour ideal for a date-night look). Both diffuse nicely into cheeks with a makeup brush for a healthy glow. While this pallet advertises a night out look, the bright finish and versatility of the colours can create a perfect springtime look. The four eye shadows and two blushers come in a sturdy, flat palette that includes magnetic sealing and a large mirror. You can try the Pressed Minerals 6 Piece Palette for yourself here for £49.95. While the price is quite high, we feel the organic ingredients are worth it plus the highly pigmented eye shadows have great staying power. When people think of pearls, they merely think of luminescent and glistening orbs used in jewellery. However, we want to introduce you to finely grounded down pearls, which have a surprising variety of uses, primarily to aid aesthetic and health benefits which in turn help to boost a glowing complexion. When The Amazing Blog heard that this 100% pure Pearl Powder had been used for thousands of years by Chinese and Egyptians (including Cleopatra), we knew we had to experiment with this micronised Moroccan Natural’s Pearl Powder! 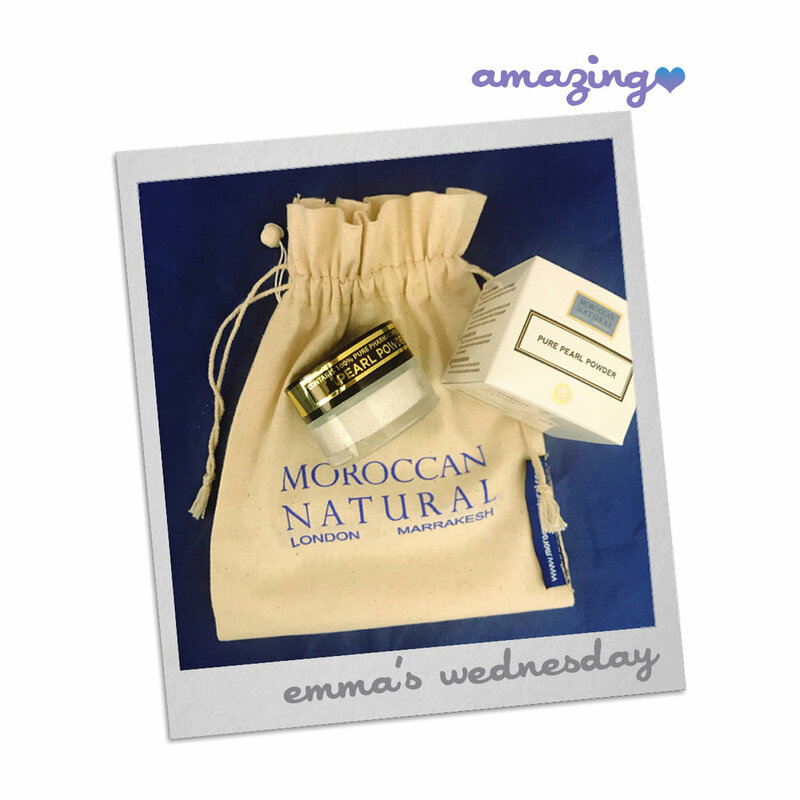 Moroccan Natural founder Carole Fraser launched this UK based natural beauty brand in 2010. It all began when she was recommended to use Moroccan Argan oil to treat both her frizzy and dry hair and a 14-year-old skin condition. After seeing the power of the fantastic properties of organic, natural products can have, Carole was inspired to start the brand. All with the premise of cultivating a line of products that are made up of entirely organic ingredients, in order to heal and rejuvenate the hair and skin naturally. Made with 100% pharmaceutical grade natural freshwater pearl powder, Moroccan Natural’s Pearl Powder takes on the ancient beauty secret which is infused with 30 different minerals. With its calcium, proteins and vitamins and a high source of amino acid, Pearl Powder will help speed healing, enhance elasticity and help maintain a perfect skin luminosity. These are all shown to stimulate skin and collagen production, smooth wrinkles, help improve skin texture and help with sun damage. Like all Moroccan Natural products, the Pearl Powder is completely natural and is free from silicones, parabens or preservatives all of which can irritate the skin. After a few weeks of incorporating the Pearl Powder into our beauty regimen, we loved the radiance it gave our complexion. The less visible sun spots, fewer large pores and a more luminous and even skin tone. To start seeing radiant results for yourself, mix a pearl-sized scoop (using the spatula included) into your daily moisturiser or try one of Moroccan Natural’s five different ways to use the powder depending on your skin care goals. Our Exec Editor’s favourite way was to have this Pearl Powder as a finishing powder, it is so finely ground that it absorbs the shine and leaves the skin supple. We really love the versatility of this 100% natural product. While a 15g container of the Pearl Powder retails at £25 on the Moroccan Natural website here. You only need use a tiny bit in each application and found that this pot lasted for quite some months.